Frater Whittington began his Teke experience at Southern Mississippi’s Colony 529, and served as Prytanis when the Colony chartered as Pi-Psi. Since his 1986 graduation, Frater Whittington served as a volunteer for his chapter at Southern Mississippi as a member of the Board of Advisors from 1994-2000 and as the Alumni Association President from 1995-2001. In addition, he has been a supporter of the TKE Educational Foundation for nearly 20 years. In February 2015, Frater Whittington was the keynote speaker at the Indianapolis Regional Leadership Conference. Frater Whittington is the Vice President and Chief Information Officer at Pactiv Corporation in Lake Forest, IL, where he has worked for over 25 years. 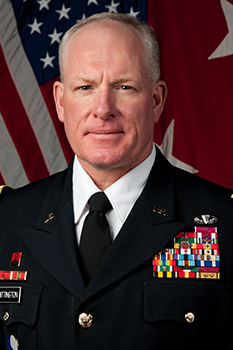 In his spare time, Frater Whittington volunteers as a high school football coach and continues to serve as a Major General in the United States Army. Frater Whittington has served in the Army National Guard for over 30 years and held command positions at the Company, Battalion, Brigade, and Division level. He has served in Operations Desert Shield, Desert Storm, Operation Iraqi Freedom, and most recently in Afghanistan as part of Operation Enduring Freedom. Frater Whittington and his wife Kimberly live in Gurnee, IL and are the proud parents of Savannah, a Chicago Public School teacher, and Charles III (Chipper) an ROTC cadet at the University of Kentucky.